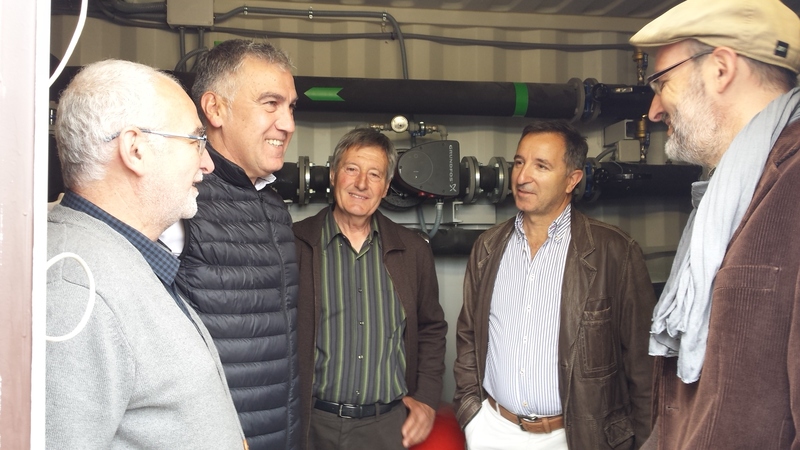 On Wednesday, April 29th, on the occasion of the implementation of the biomass plant with vine debris in Cava Vilarnau, several people involved in the project met: Damià Delàs, the company manager and representative on this occasion of INNOVI; the Town Council of Vilafranca, with the attendance of the Environment Municipal Councillor Josep Maria Martí, the Project Coordinator Jordi Cuyàs and other technicians as Salvador Ventura and David Alquézar; the President of COVIDES, Joan Marcé; the manager of NOU VERD, Juli Silvestre, accompanied by several company professionals; the technical services department of Environment of the Diputació de Barcelona; and the representatives of SAVIA, Mr. Cerveró as suppliers of the plant. This project, called “Vineyards for Heat” is a LIFE plan co-financed by the EU. This biomass plant is pioneer in the framework of the European Union, because debris of pruning generated in local vineyards are used as biomass the while they are supplied by wine growers associated with Covides. We must emphasize the importance of joint work done by Codorniu, Covides, Innovi, Vilarnau and Nou Verd. This is an example of co-operation between the wine grower sector and different manufacturers, with a result of an innovative and sustainable project. Within this program it should be noted that the Town Council of Vilafranca is now in the phase of restricted competition. Five companies design a blueprint from which the company that will make the final draft of La Girada District Heating will be selected. The company Codorniu, also participating in the program, has made several tests during these days, with vine biomass in its installations in Raimat, with very positive results.